One Sunday afternoon, I got a call to accommodate a meeting on that day. It’s only for half an hour they said and requested we meet immediately! I obliged. This is how I met Sai and Anusha for the first time. 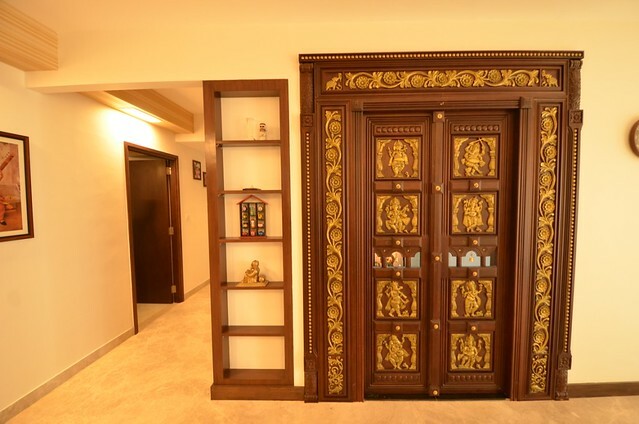 They had just purchased an apartment at Divyasree and wanted it done up in traditional Chettinadu style. 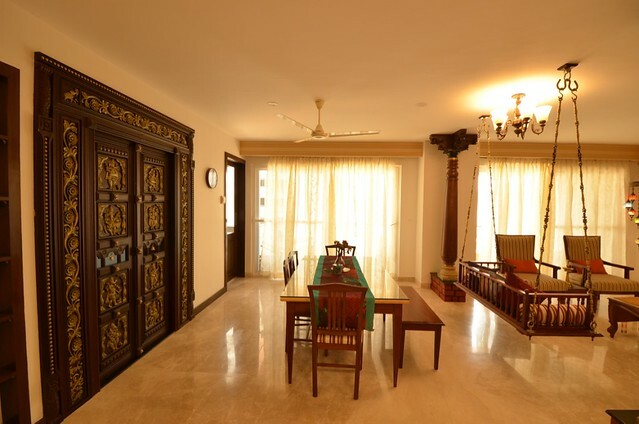 Anusha had grown up in Chennai visiting Chettinad homes in the city and had grown to love this style. 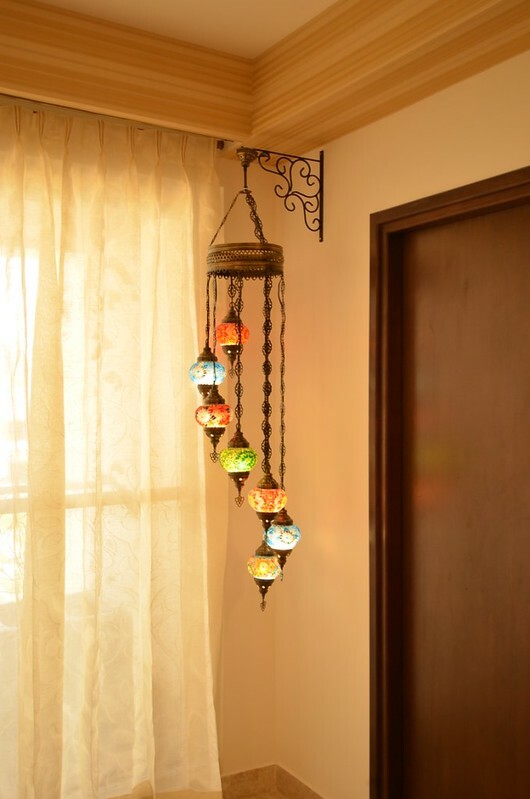 She had come across Destination Designs online and wanted us to do up her home. We hit it off almost instantly as we bounced ideas on what the home should look like. Our choices were similar and it was easy to progress on design specifications. 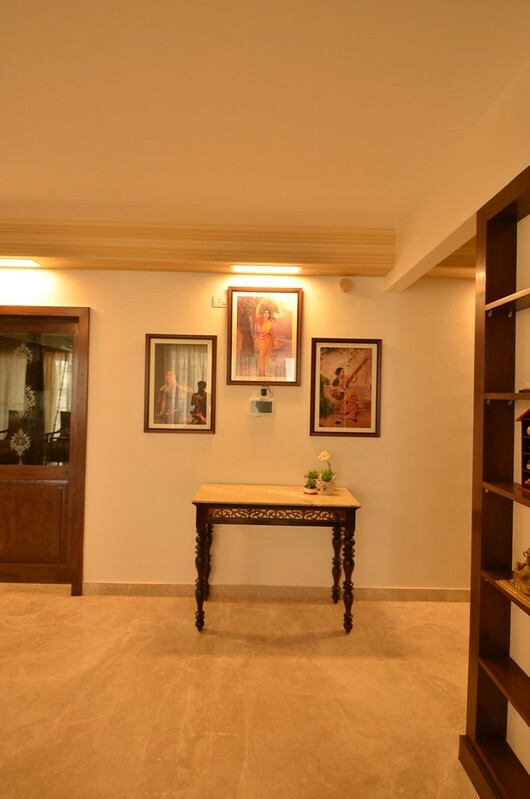 As Anusha said, I treated this home as my own more than that of a client. We took almost 4 years between our first interactions to actual start of the work as the builder took a while to handover the home. 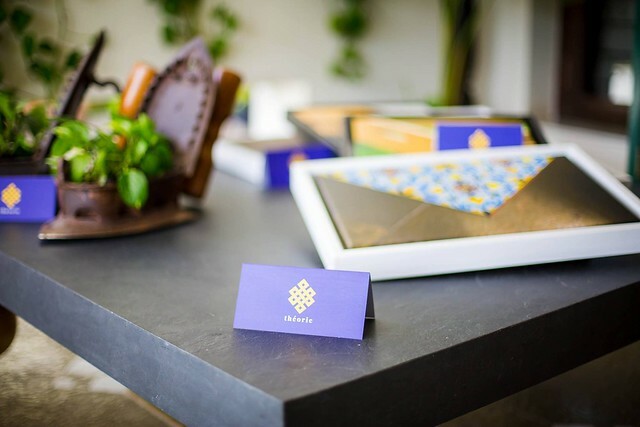 This gave us ample time to design and source materials for the home. Once we started work onsite it took us 4 months from start to finish. 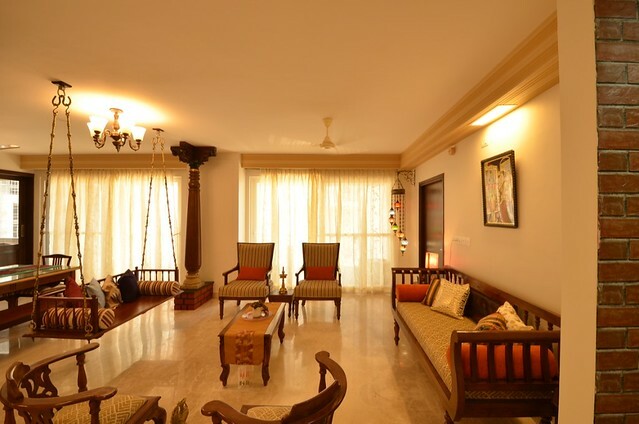 When the job was completed, Sai and Anusha gained their dream home and I gained great friends. 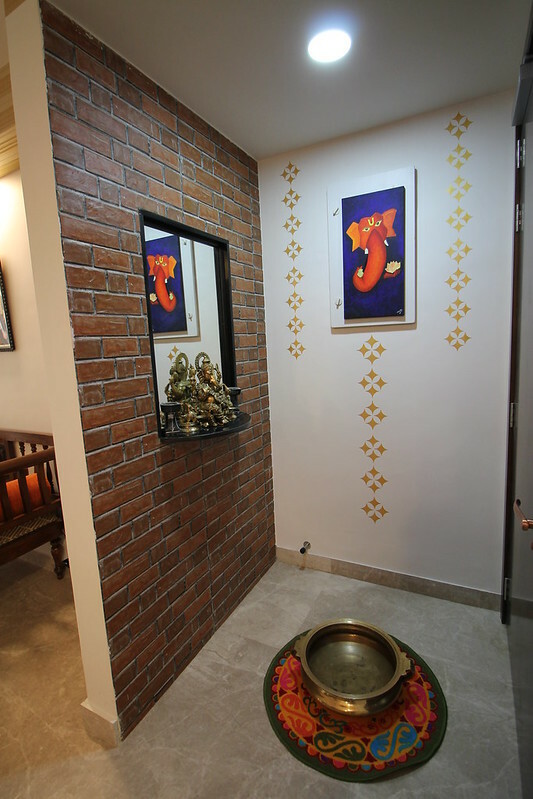 The foyer of the house has a faux brick façade to seat an idol of Ganesha which Sai is very fond of. 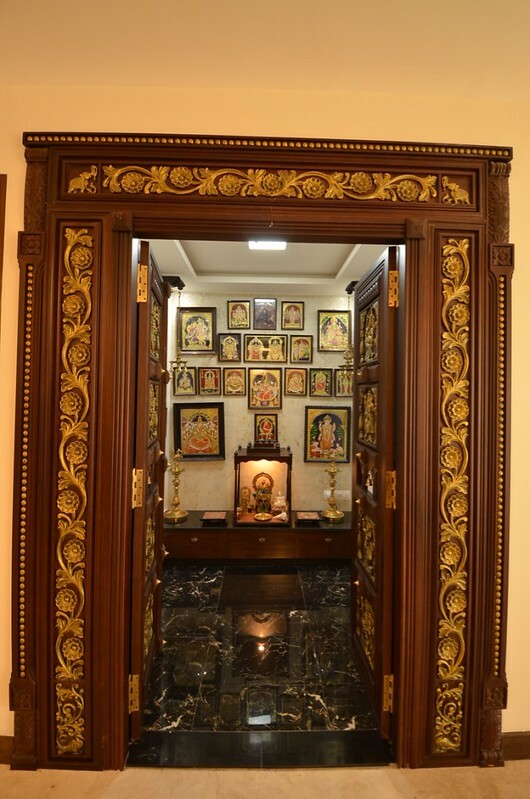 The view below is as soon as one enters the home; it is the entire expanse of the living room, dining room and the pooja room in the far end. 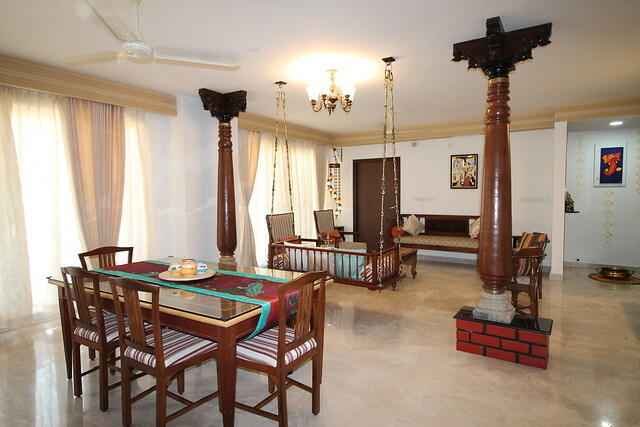 The living and dining spaces are divided by antique Chettinad pillars and a custiomized swing. 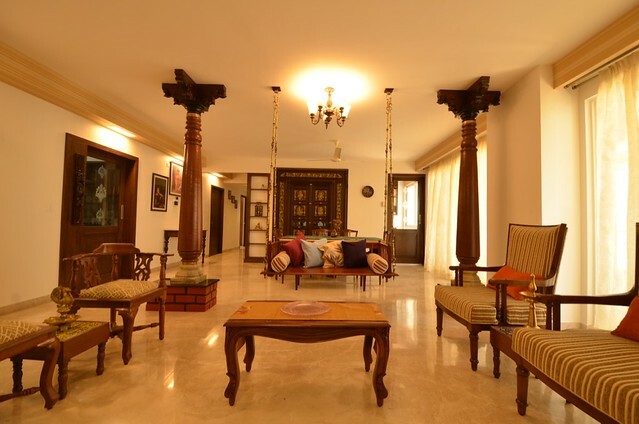 All the furniture in the living and dining room is made from reclaimed teak wood . 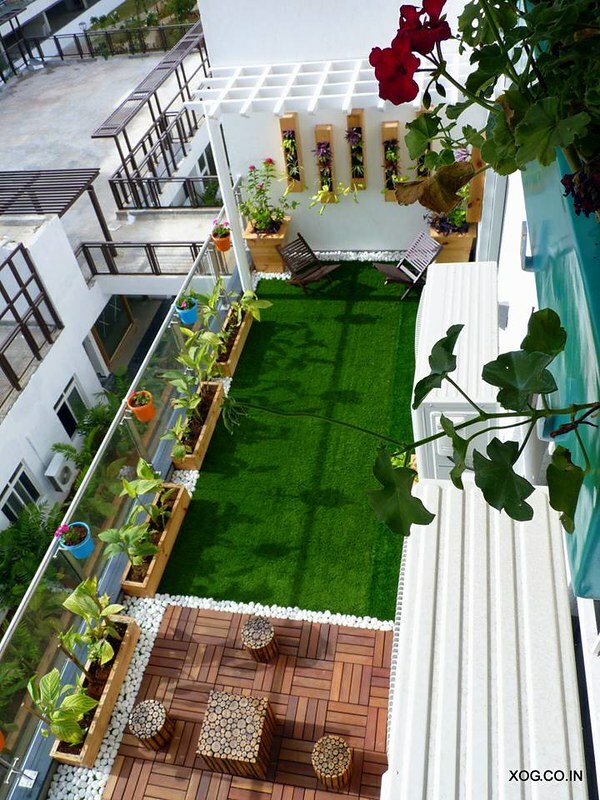 This home is a 2500 sq.ft. 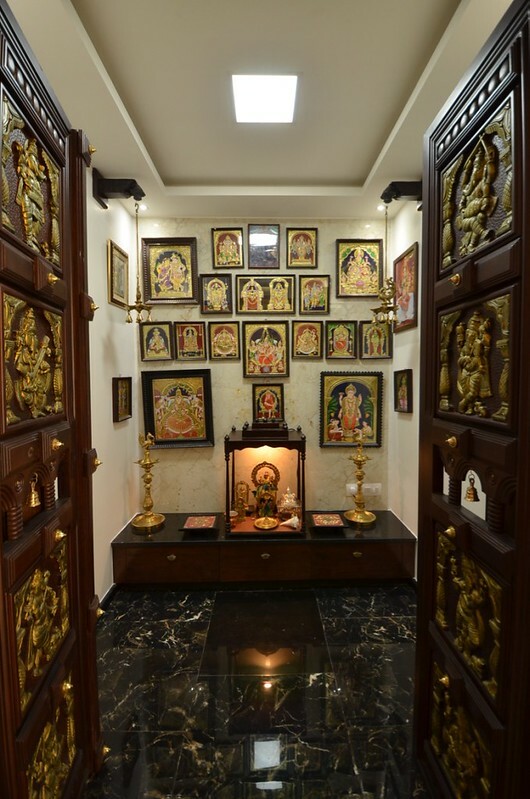 apartment .The home had to centre around the puja room as this was Anusha’s sanctuary. 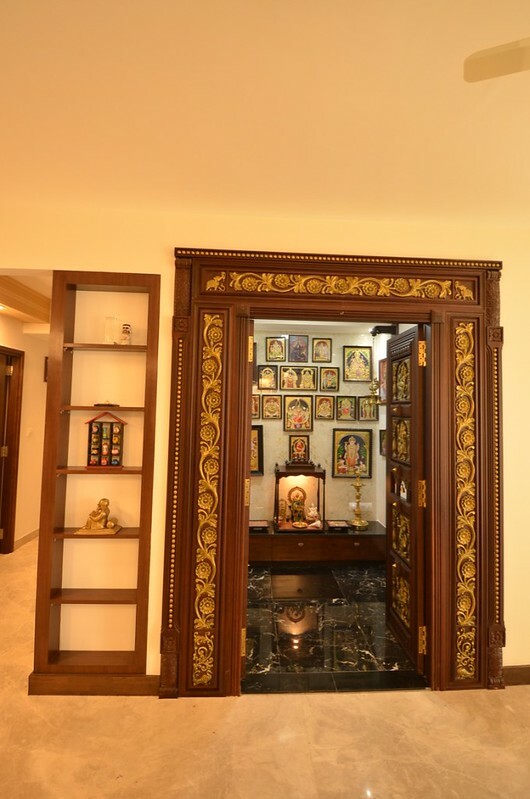 We designed the living and dining area to accommodate a puja room.The puja room holds Anushas collection of Tanjore paintings which adorn the wall.The carved door to the puja room was a gift from Anusha’s father Mr.Ramesh ,who was also instrumental in decisions pertaining to design. 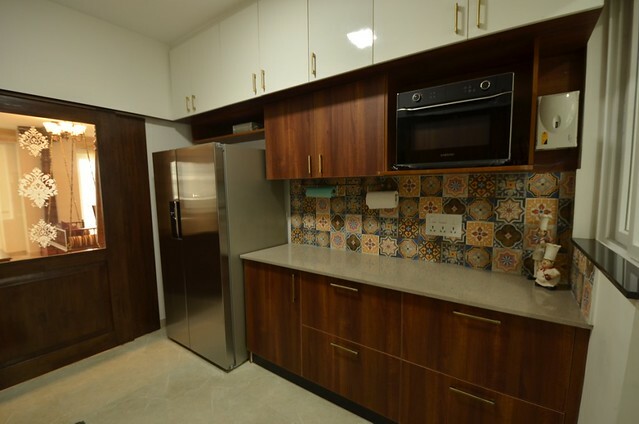 The apartment had a compact kitchen and we kept it simple with wood coloured cabinets, but keeping the loft white so that it looks less crowded. 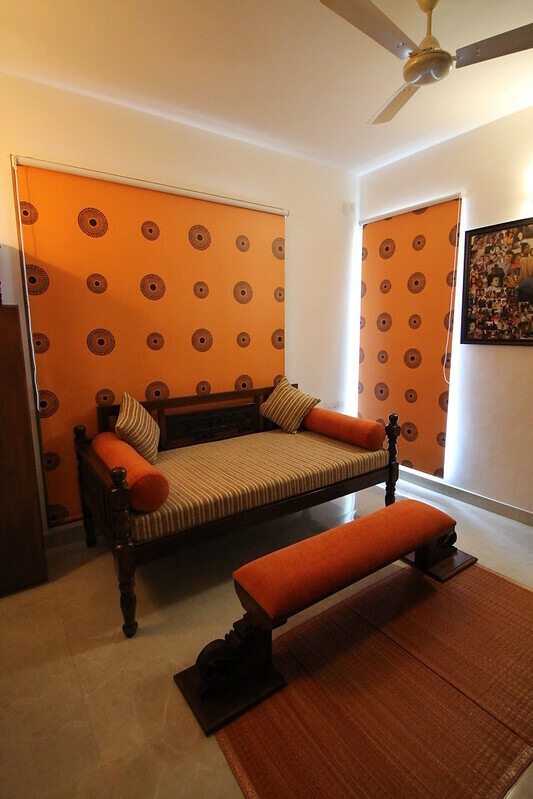 The Master bedroom has a hardwood floor which made us keep the furniture dark coloured to contrast. 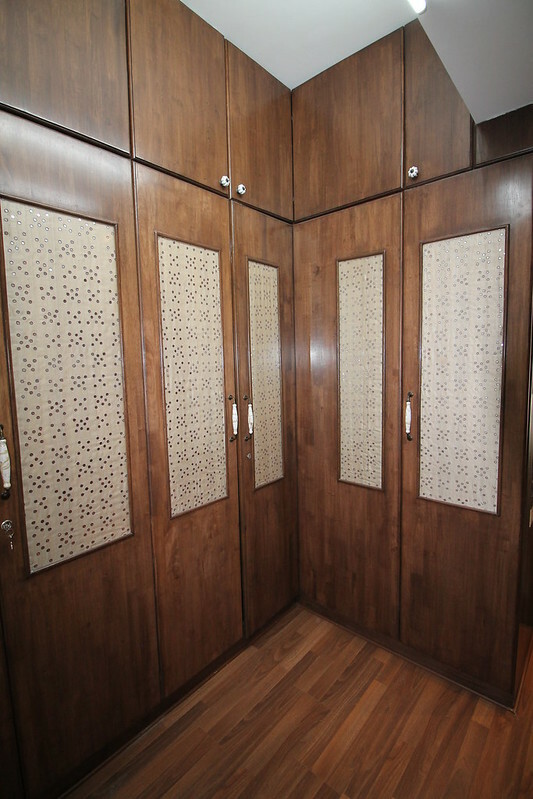 The walk-in wardrobe has mirror work fabric paneled shutters. 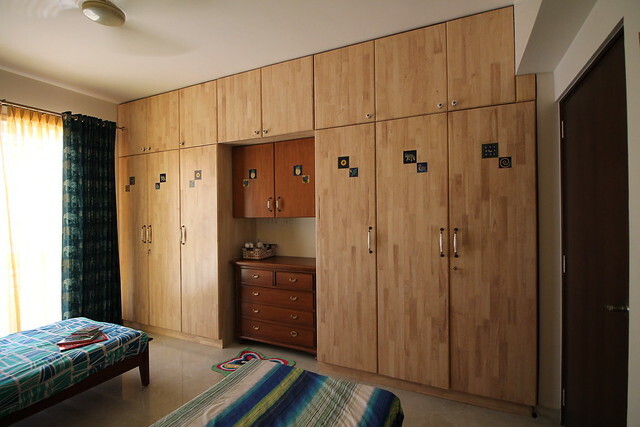 The kids room was kept light and cheerful in the natural rubberwood colour. 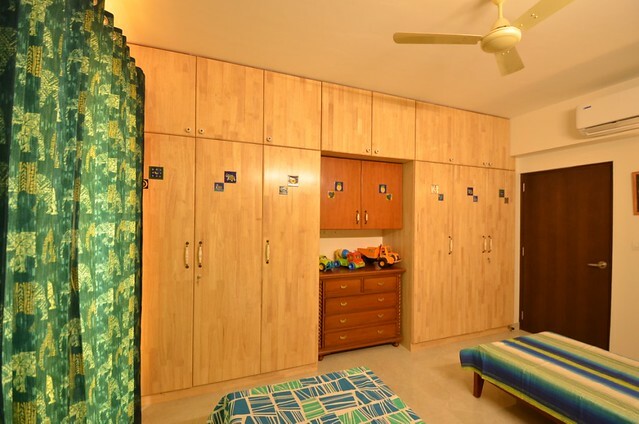 Jaipur blue pottery tiles embellish the wardrobe and headrest. We used animal and fruit motifs to keep the kids happy. The same elephant motif is continued onto the curtains. 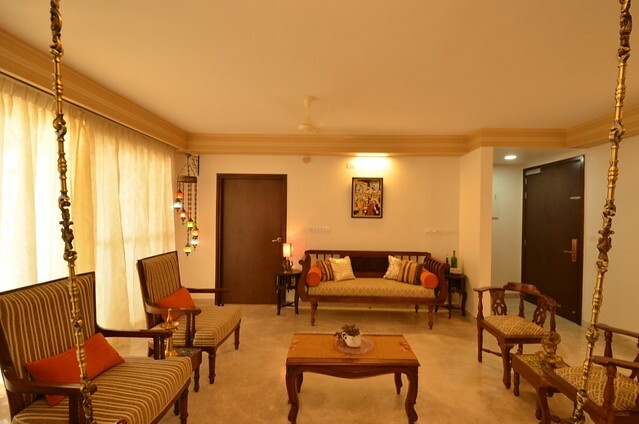 The TV /entertainment room has a majestic teakwood diwan with a foot rest. 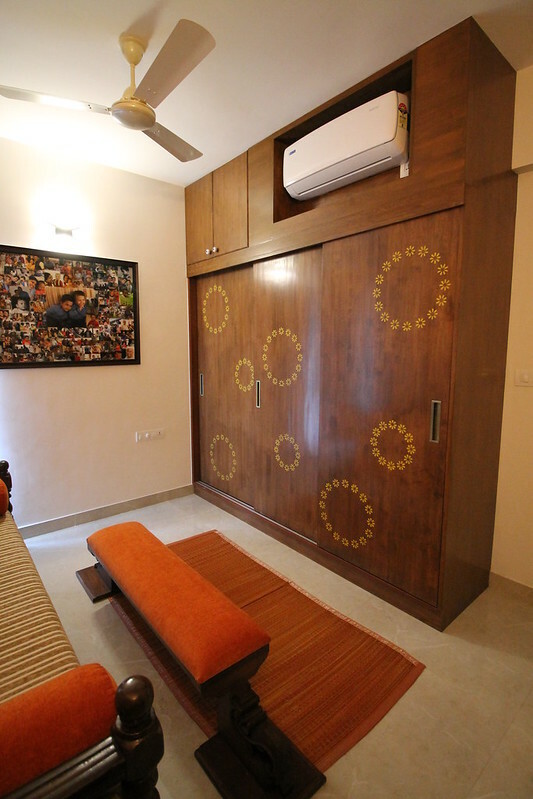 The TV is accommodated inside the sliding wardrobe .This was done since the kids use this space to play and the TV is safe within the cupboard. The motifs on the cupboard we matched to the blinds in the room and to add a pop of colour. 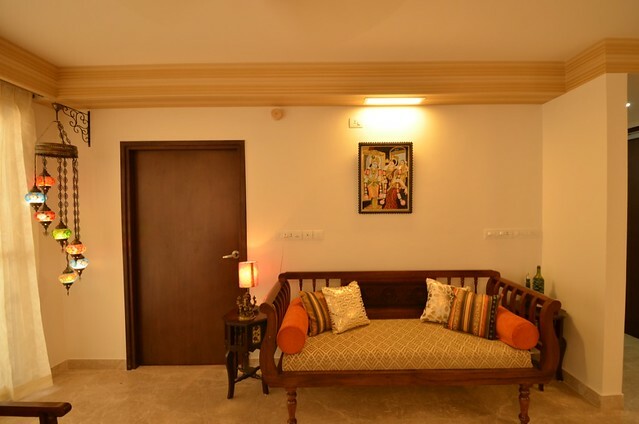 Parents room is kept simple and functional with a wardrobe, a refurbished old desk that Anusha used as a child, and a resized antique rosewood bed. 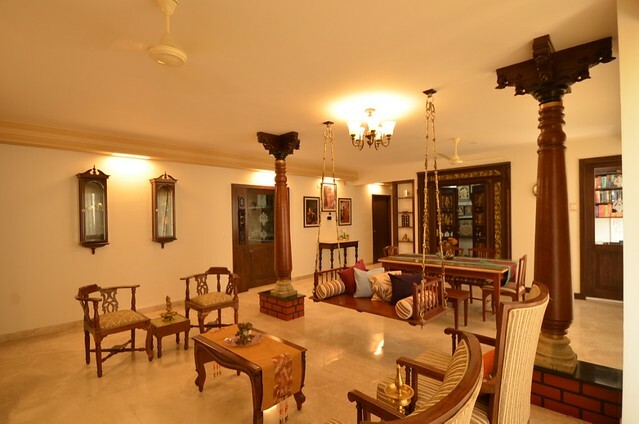 The over all theme of the home is kept traditional in design and tied together by colour or accents. 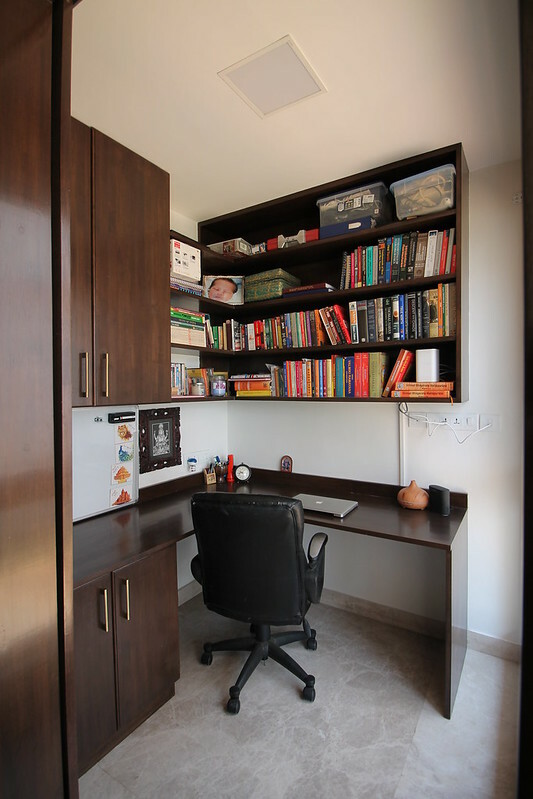 Sai works from home often and wanted a study to be accommodated. We managed to accomplish both requirements adjacent to each other. And the living and dining area still looked spacious. 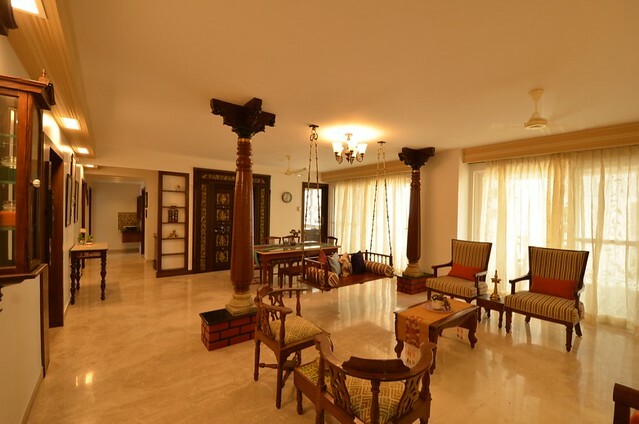 If you like Chettinad style homes, then you may want to check this one by Jyothika as well.